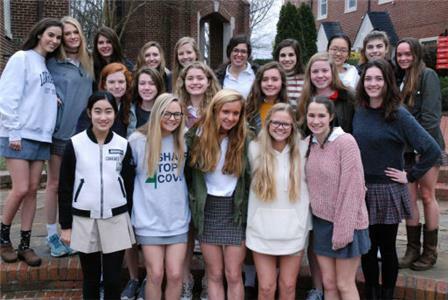 Team members are seniors Hannah Berke, Virginia McEvoy, Mary Kathryne Schumaker, and Josie White; juniors Catherine Cansler, Sydney Cansler, Beth Harrison, Merrit Newton, and Belle Wilson; sophomores Isabella Allan, Caroline Barker, Kali Cromie, Emmy Davis, SabrinaFrancke, Emily Hale, Lauren Hill, Jade Liu, Riley Murdock, Grace Pippin, and Hannah Rosser; and freshmen Rosa Anderson Barrera, Emrick Garrett, Janie Pippenger, and Shirley Zhang. The Baylor girls' cross country team has been recognized by the TSSAA as a recipient of the Distinguished Scholastic Achievement Award. This marks the third consecutive year the Red Raiders have received the honor. This year's squad posted a remarkable team grade point average of 3.84 during the fall 2017 season. In addition, 92% of the team earned further recognition as recipients of the Student-Athlete Award of Merit, given for maintaining a GPA of 3.5 or higher while in the competitive season. Baylor won three prestigious cross country meets this past season - the Tennessee Classic, the McCallie Invitational, the Front Runner Championship - and, paced by All-State performances by freshman Emrick Garrett and junior Sydney Cansler, finished fourth at the state championships..
Baylor coach Heather Ott expressed her pride in the accomplishment, "One of the many gratifying aspects of coaching these remarkable athletes is the fact that they are so completely committed to the life of the mind and to excellence in all pursuits."